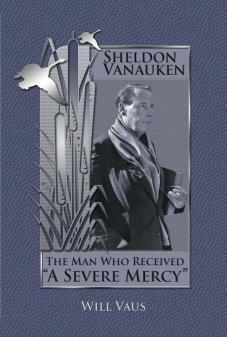 Sheldon Vanauken: The Man Who Received "A Severe Mercy"
The life story of Sheldon Vanauken is one of adventure, romance, conversion, grief, and recovery. Much of this was chronicled in the autobiographical bestseller, A Severe Mercy. However, a good deal of Vanauken’s fascinating life remained shrouded in secrecy … until now. Through a process of careful historical research, including interviews with Vanauken’s many friends, colleagues, and students, Will Vaus reveals to the reader the numerous facets of a complex character. In this biography we discover: Vanauken the struggling student, the bon-vivant lover, the sailor who witnessed the bombing of Pearl Harbor, the seeker who returned to faith through C. S. Lewis, the beloved professor of English literature and history, the feminist and anti-war activist who participated in the March on the Pentagon, the bestselling author, and Vanauken the convert to Catholicism. What emerges is the portrait of a man relentlessly in search of beauty, love, and truth, a man who believed that he found all three in the end. "A sympathetic, perceptive and well researched study of one of America's most important recent religious writers. Readers of A Severe Mercy are in Will Vaus's debt for such an illuminating and informative study." "In his new biography, Will Vaus has answered so many of the questions I have had for years about Vanuaken and his wife, Davy. Vaus has masterfully captured the spirit of Vanauken, his deep desire for beauty, his mistakes along the way, and eventually his love of God. Reading this biography takes me back to those same deep emotions I have every time I read A Severe Mercy." "Sheldon Vanauken's story of C. S. Lewis, Oxford, a passionate love, and a tragic loss captured the imagination of Evangelical Christians thirty years ago. Will Vaus' biography of the author of A Severe Mercy captures the same mixture of a flawed romantic quest driven by a longing for truth, goodness and beauty, that culminates in the fullness of the Catholic faith. Vaus' book is a study in divine providence and a captivating biography of a unique and noble soul." Fr Dwight Longenecker -- blogger, broadcaster, author of The Quest for the Creed and Catholicism Pure and Simple.